A few months ago, I watched Woody Allan’s movie Midnight in Paris. I thoroughly enjoyed the movie and let myself be swept away with the romantic notion of Paris. I bought in so hard that when I left the movie the first words out of my mouth were, “I want to go to Paris”. Ben responded with, “we should do that soon”. I know that his soon probably meant in the next 10 years, but the thought of it festered in my brain so much that I became very Paris focussed, talking about how much I wanted to go to Paris with everyone I knew. Well luck would have it, sometimes if you talk about something enough, it happens. Landing in Paris last night, I quickly developed very strong emotions towards a city I’m hoping to become acquainted enough with in the next week to be able to declare my love to. I am happy with the apartment I am staying in and the area it’s located in(Marais). I know people think that over-planning takes the fun out of travel, but I love transporting into a city and seeing landmarks and stores located on streets that I already feel familiar with. 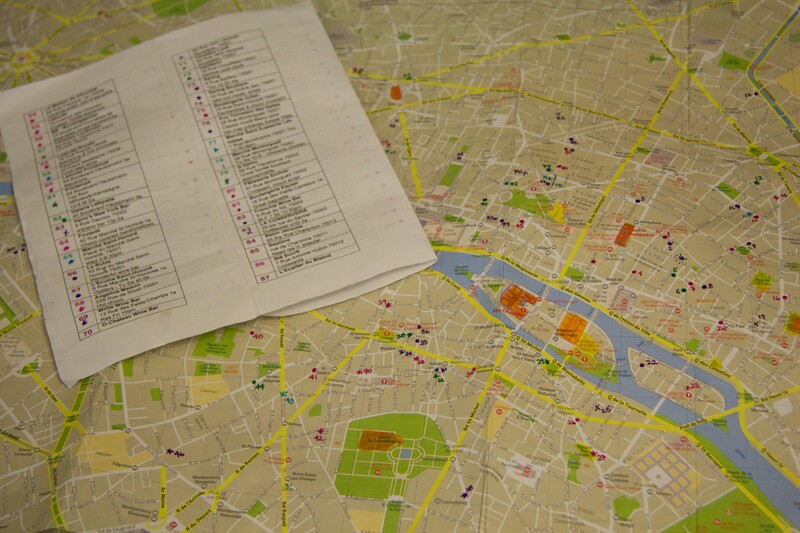 My map of Paris, plotted with colour-coordinated coordinates which will act as my food guide this next week. Not knowing what time we’d arrive in the city and being somewhat confident enough with my advance planning, I thought that we could wing it on our first night without reservations. 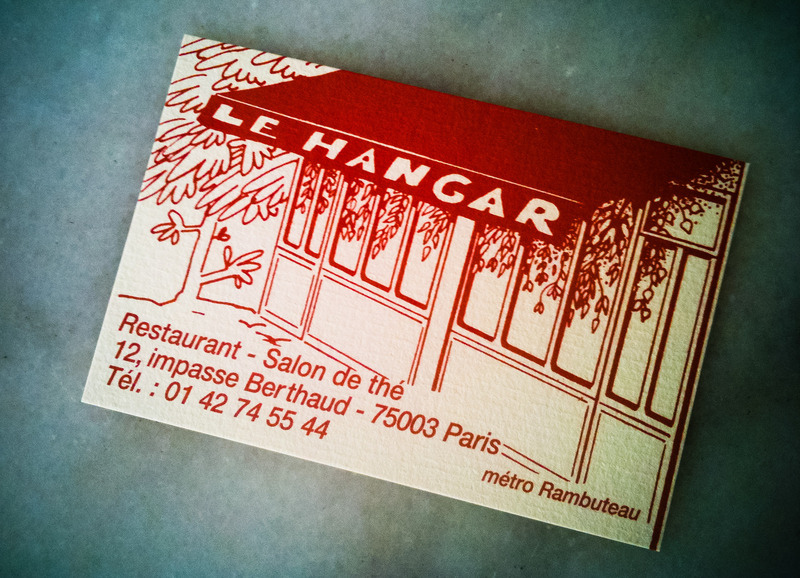 I had a couple of restaurants on my list nearby to the apartment but we decided to check out Le Hangar because Henry(my father-in-law) said they had the “best steak tartare”. I was hopeful that even though it was a Friday night, we’d be able to get a table. 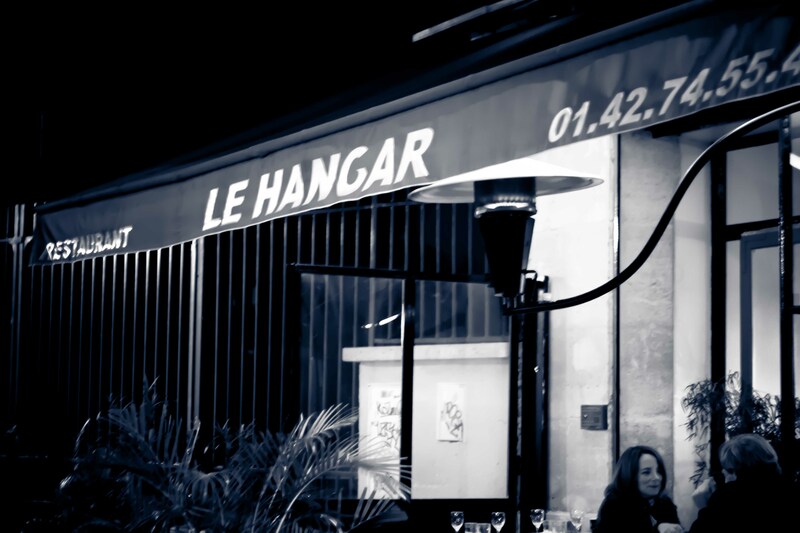 Le Hangar is a few blocks away from my apartment, down a small street which could have been hard to find but Henry gave a great description on what I was looking for, so there were no problems finding this little gem. We were starving, so we were lucky to grab the last table they had available. 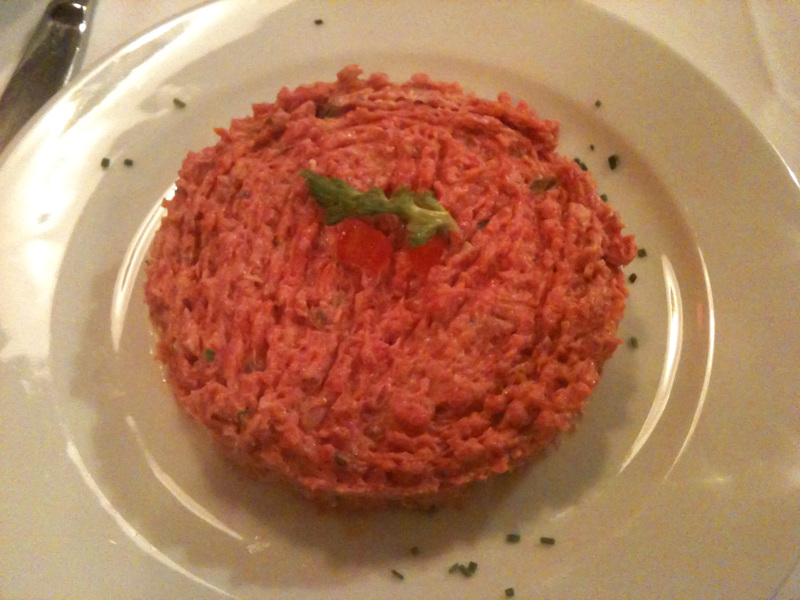 Even though they offered us an English menu, there was no need because I saw what I was looking for, steak tartare. They also had duck confit on the menu and I decided that would also be a perfect dish for my first meal in Paris. We started our meal with a glass of champagne to celebrate our journey to Paris. It was at that moment that the feeling of joy swept through me completely. As much as I complain sometimes or wish things were different, I LOVE MY LIFE. I can’t have a meal without some sort of greens, so I ordered a haricot vert salad to begin. 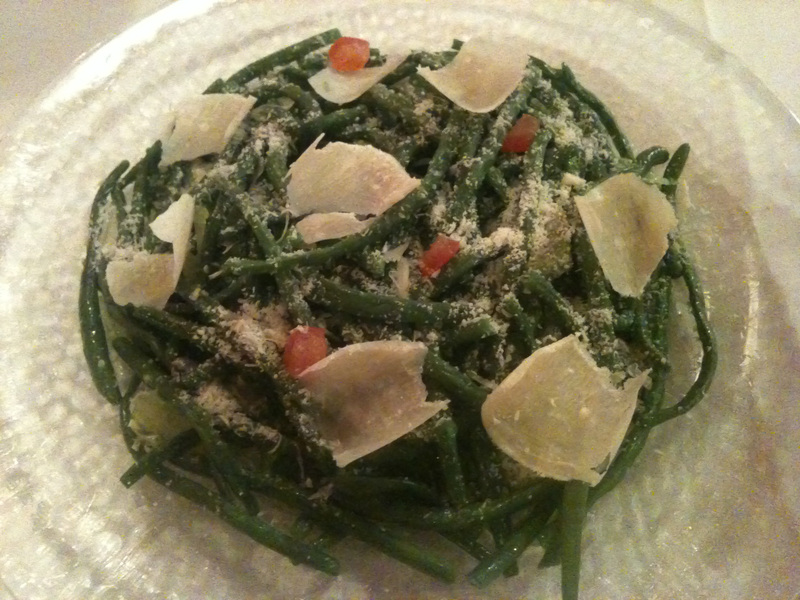 Tender haricot verts sprinkled with finely grated and shaved parmesan. Simple in its presentation but wow’s in its delivery of flavour. We weren’t quite sure whose order came with the tater tots, but I originally claimed them as mine because I wanted them to sit close enough for me to devour them. If only tater tots could be as delightful as these nuggets of joy which turned out to be fried pieces of mashed potatoes. 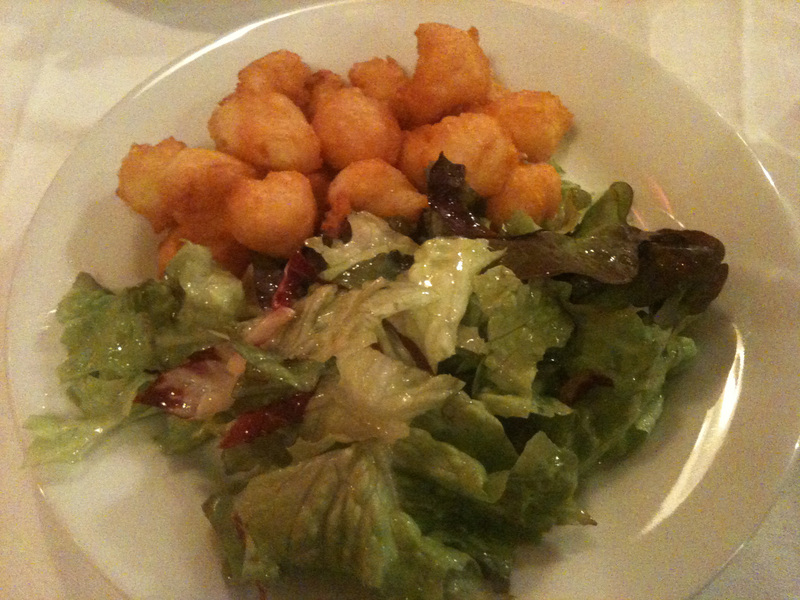 We soon realized that the tater tots were an accompaniment to the tartare as it was served without bread or fries. Ben wished there was a vehicle to transport the steak tartare, I knew all it needed was a fork. A huge portion of a very tender steak tartare, seasoned delicately as not to mask the flavour of the very flavourful beef. My french food vocabulary is not bad and I’m hoping it’s strong enough to get me through on this vacation. When I saw “confit de carnard” on the menu, I had a good idea of what I’d be getting. 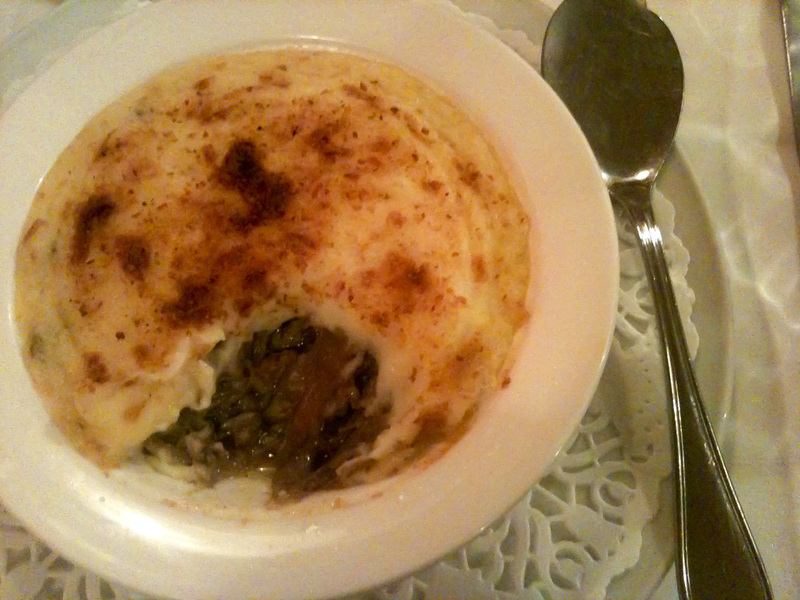 What I didn’t realize was that it would come out in the form of shepherd’s pie. Fatty duck confit nestled in between 2 layers of luscious and smooth mashed potatoes. Some may think fatty is a bad word. I think it’s a great one. Too stuffed for dessert, we had to pass. No regrets though as I know I’ll have my fair share of decadent sweets over the next week. And the steak tartare? Yes it was the best I’ve ever had. Next PostNext When life gives you bad stomach… Eat fallafel!